Multicolor tweed skirt with golden GG-hardware. 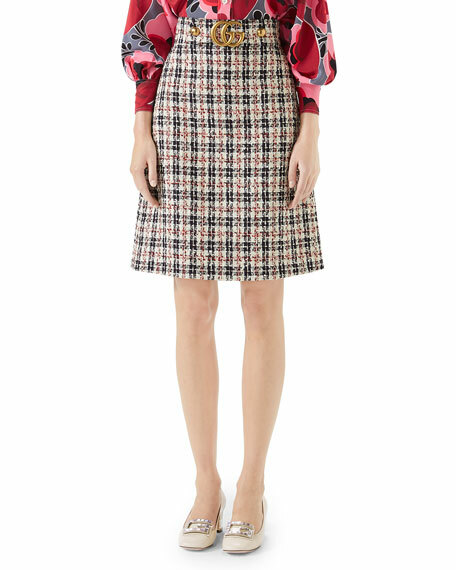 Gucci wool-blend crêpe skirt with creased finish. Approx. 20.5" from waist to hem (size 40). Double-G hardware in antiqued brass finish. Side zip closure. Sits at high waist. Knee length. A-line silhouette. Wool/silk. Silk lining. Made in Italy. Gucci tweed mini skirt with golden embroidered ribbon detail. Retro Interlocking G buttons. Back zip closure. Cotton/viscose/nylon. Made in Italy. Cady crepe skirt features an inverted center pleat with G-button trim. Nonadjustable leather belt with hardware. Sits at natural waist. Cady crepe skirt features an inverted center pleat with G-button trim. Nonadjustable leather belt with hardware. Sits at natural waist. A-line silhouette. Hidden back zip. Mid-thigh length. Wool/silk. Made in Italy. Gucci mini skirt in bleached, washed denim with floral embroidery. High waist. Five pocket style. Button/zip fly; belt loops. Cotton. Gucci mini skirt in bleached, washed denim with floral embroidery. High waist. Five pocket style. Button/zip fly; belt loops. Cotton. Made in Italy.